Will it ever grow back? It’s going to take forever! No one will talk to me! .. an excerpt from the hysterical screaming, hyperventilating and cries from my 7-yr-old daughter after a recent haircut was a bit shorter than she envisioned. At least she held it together at the salon. 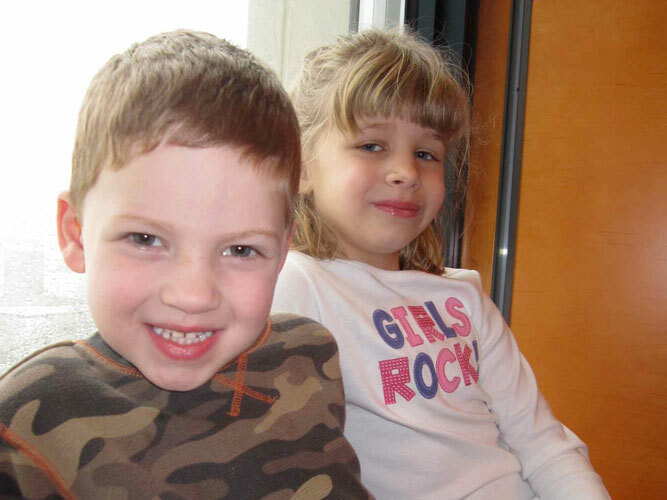 Both kids – my daughter, Ava, and 5-yr-old son, Calvin – have always been impressively good, sat still and followed up, down, side directions from hairstylists. I don’t know why this is. I recall going to Kids Hair for Ava six years ago. 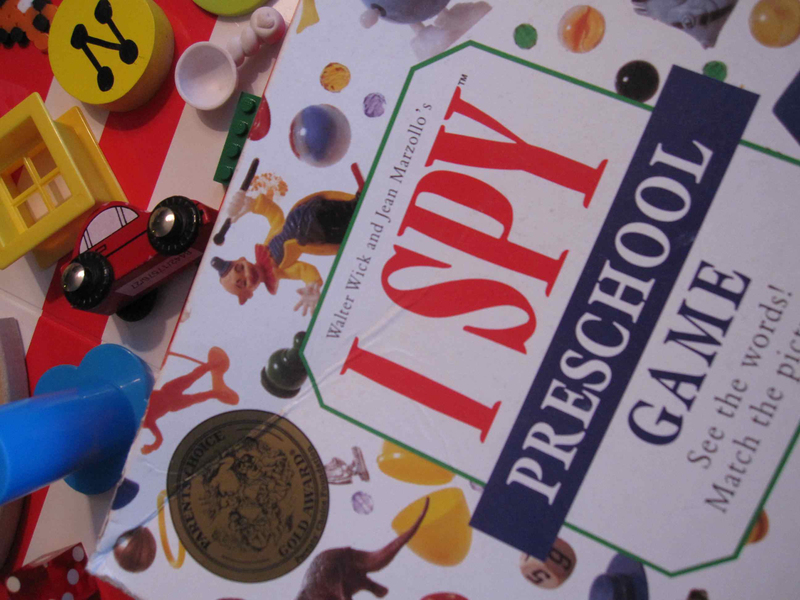 A lot of hype, sitting kids in front of tv’s and candy – – too much stimulation for this mom. 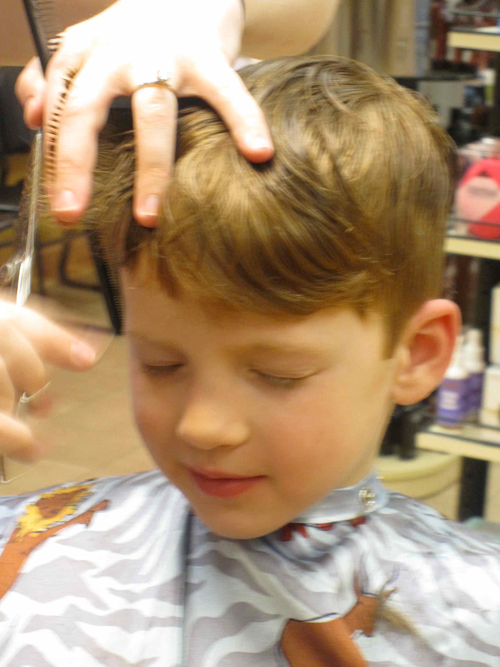 We’ve typically went to Mastercuts for kids’ cuts. They used to have a one-night-a-week deal for like $11.95 and we’d run over to the Mall of America location, no appointment necessary. And while you wait, please do shop. This was about all their haircuts were worth at an age-appropriate price. When Ava turned five, after a series of not-so-good cuts at any new stylists whim, we upped our game to more professional salons. 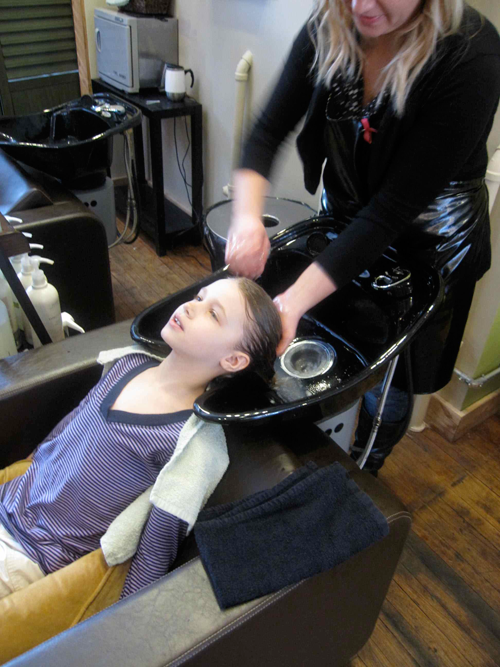 She loved getting her hair washed at the salon and we found the Aveda salon – Bella – in my husband’s home town to be a good value if it coincided with a trip to Luck, WI. We also checked out Miyagi in Northeast Minneapolis where they don’t accept tips, but stylists seemed to change every month so couldn’t find someone consistent for her. Then we found Rue 48 Salon. 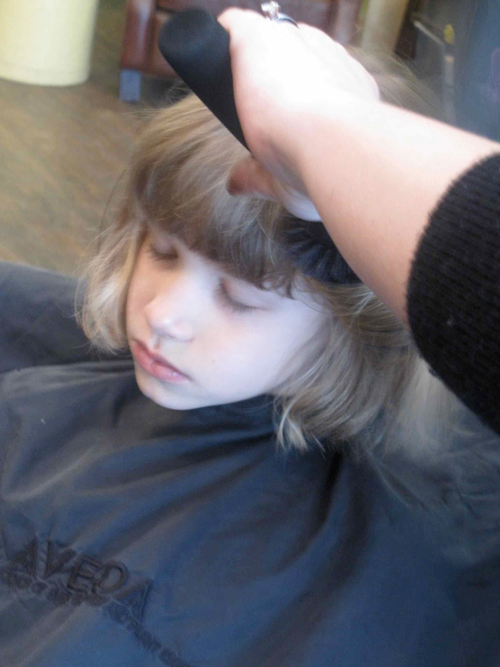 A neighborhood salon to us with kids cuts for $25. While I’m still not ready to graduate Calvin to that level, Ava is ready to have a consistent hairstylist, a convenient location and a cut that works for her. On Thursday, Calvin and I headed to Mastercuts MOA. Always easy to get in on a week-night. Everytime we go, a stylist confidently describes what they’ll be doing while Calvin is mesmerized by the spikiness of their hair, streaked with hot pink to purple. Calvin’s got a colic that is the determining factor for how to cut his hair. This particular stylist, Liz, assures me she understands the colic. She leaves that area longer so it has a chance at lying flat – it is on the top of his head after all. Instead of a 3 setting on the clipper, we go for 4. I’m okay with the cut. You never quite know what you’re going to get. Calvin is happily chatting it up – wondering if Liz is married, wanting to see her engagement ring. When we checkout, we get a tattoo and pay $13.95 for the cut with a $3 tip. We’re still looking at $17 monthly. Ava’s appointment is two days later at Rue 48. Ellie is her stylist she’s seen about four times now. She trusts her. Ava is generally talkative and happy, openly sharing embarrassing stories about our family life and such. After the wash and rinse, I come over for the cut consultation. Prior to the appointment, Ava agreed to get more than just a trim for her past-shoulder-length locks. She makes a cut mark with her hand, I move it up just a bit more. We’re talking chin length, a little longer. I am nervous about how it will go. As Ava sees the shortness of it all, she continually asks to be done with the cut. She’s holding it together. Ellie finishes up quickly while I talk about the weather and such, trying to keep Ava’s mind off the shortness and pending breakdown. We get to the car to leave and the streaming tears begin. It gets worse at home. She wants no one to look at her. Perfect timing to go to her dance competition with all the girls with their long hair in fancy buns. Timing is way too tight – she chokes down a piece of toast and some eggs. I help her with her costume in silence. We arrive. She hides behind me and doesn’t want to see her dancer friends. She is not yet ready to face her Grandma who drove all this way to see her perform. We sit through the hour-long Just For Kix show, awaiting her dance to Breakthrough which is last. She’s smiling, her chin is up. Thank goodness. Later in the day, she is checking the cut in the mirror, brushing, tossing, getting used to it. By mid-day she is optimistic and liking her new look, citing other friends at school who have shorter cuts. She also wants to let Ellie know that she survived the experience and things are looking up. 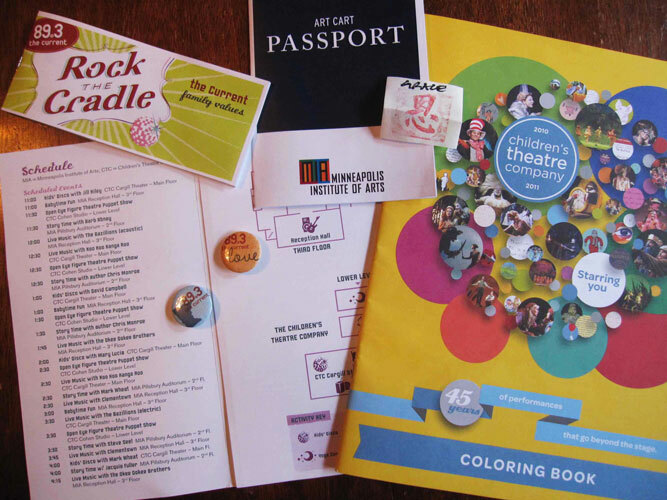 Today’s Rock the Cradle event at the Minneapolis Institute of Arts (MIA) / Children’s Theater seemed and huge success despite the small blizzard pending. Since the snow started at 9:30a.m., many savvy event-going parents planned to get to this event early today to beat the crowds and the snow. We almost opted out entirely, but my 7-yr-old daughter and I decided to go, based on previous experience. The rest of the family voted to stay home and play cards. We arrived at noon and there was nowhere to park – the surfaces lots, three parking ramps and streets were full. (Note: my earlier blog about ease of parking, getting in and out, apparently only applies to the monthly family programming, not this annual event.) We waited at least 10 minutes for an on-street parked vehicle’s owner to brush her car down and leave so we could grab her spot. Worth the wait. We were greeted in the lobby by a Current staffer who handed us a program and coupon book. There were arrow signs on the windows and around both buildings directing people. There was plenty to do between some specific things with start and end times and other things going all day long that you could just happen upon. By 12:10 the tickets for the free hourly puppet shows were all but sold out – there were a few remaining for the 3:30 performance. Moving from the Children’s Theater to MIA, we took our seats to hear Chris Monroe, the cartoonist and author, as she sat in a big overstuffed chair on the MIA Pillsbury Stage and read three of her books while the pages displayed behind her. Ava, my 7-yr-old, was annoyed with all the babies crying and kids talking. Monroe read over the din and chattering (which died down by book two) and even seemed to find it and rediscovering her own stories amusing. Ava liked the Sneaky Sheep best and I enjoyed the Monkey with a Tool Belt and The Noisy Problem story including monkey’s elaborate tree house with an elephant stuck in his laundry chute. 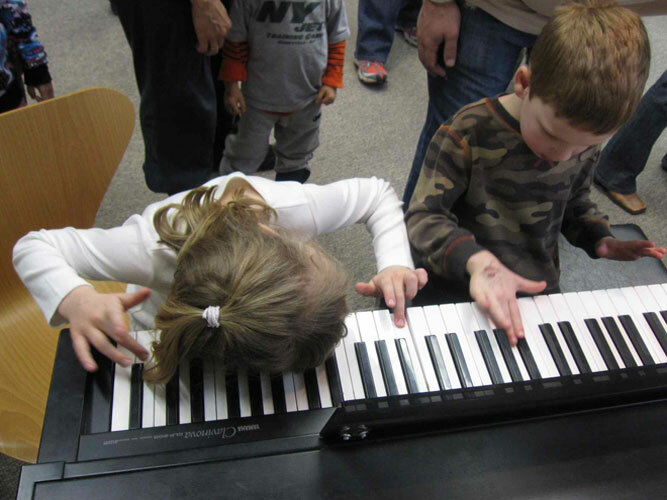 Still in the MIA, we popped into the Musical Petting Zoo. 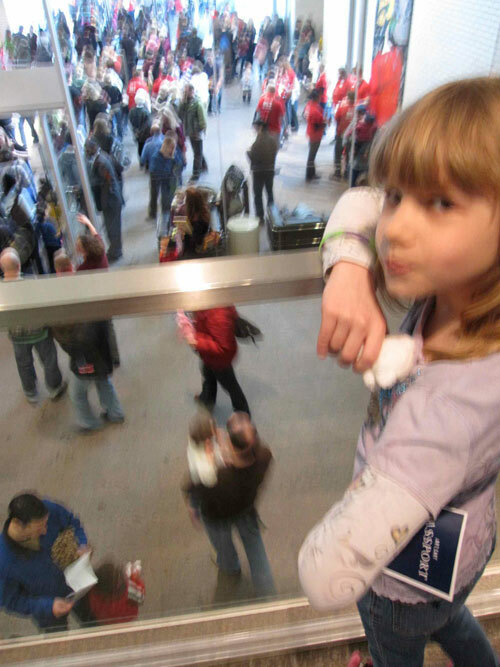 Too loud, crowded and possibly past piquing her interest since she’s technically at age 7.75 and the event touts its programming as appropriate for ages 2-8. 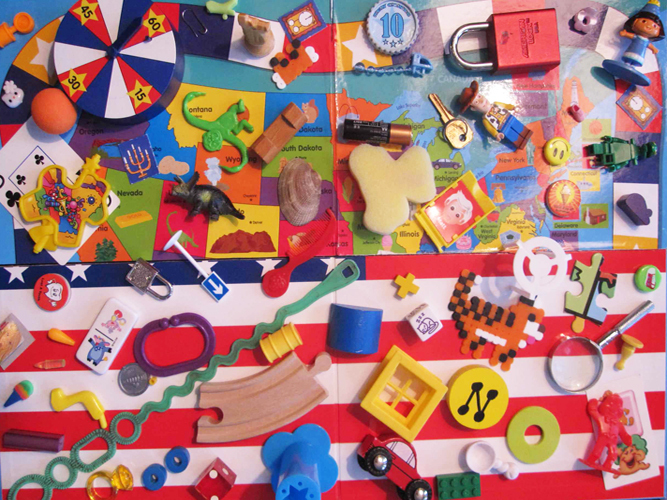 We did wander around the MIA to find art carts complete with passports to stamp upon your visit to each one. Now this intrigued her. She recapped what she learned about the mummy in the Africa area through the Art Adventures program and stamped “Grace” in Chinese at the China art cart to take with her to see if she could replicate at home. Then back over to the theater side. We just missed Koo Koo Kanga Roo and only joined the Kid’s Disco area briefly with Dave Campbell. This area feels like a winter picnic. Parents literally plop down anywhere on the floor with all their gear and people just maneuver around. Ava got some good snacks courtesy of Mississippi Market and a tattoo from Pizza Luce. 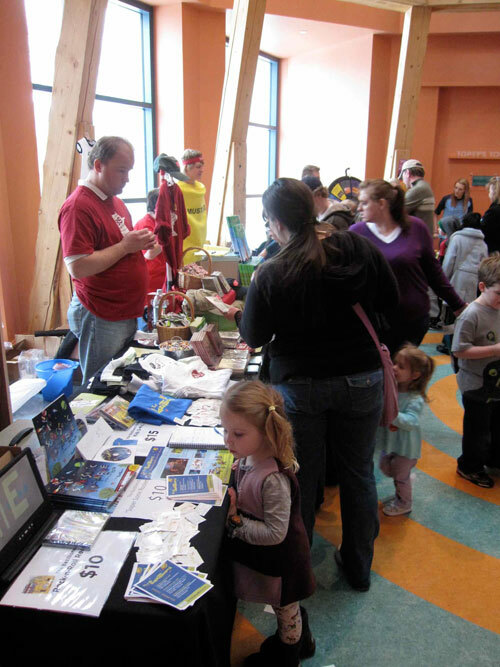 We do some browsing in the central theater area where books, cds, t-shirts and merchandise is for sale. We got some cool Current buttons. I don’t recall there being a coupon book last year, but this year’s seems a good value with partners like Blooma Yoga, Crave, MN Children’s Museum and Creative Kidstuff with deals in the mix. What next? A quick look outside to see it’s still snowing. We decided to head it out as planned at 1:30. True to form, another 1.5hour outing. 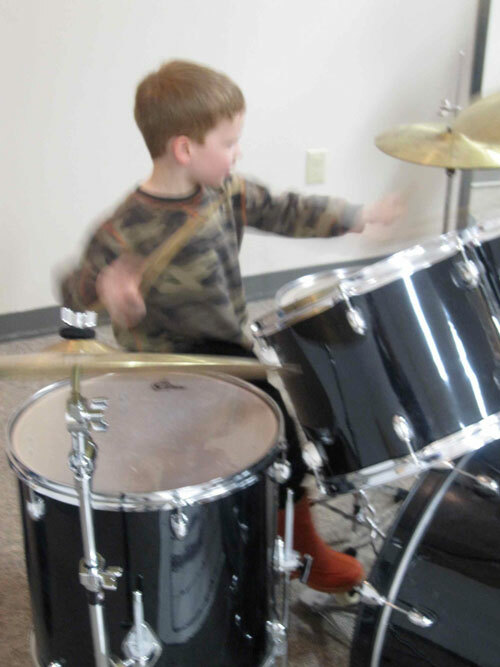 Because I may only have one more year left for kids to fit in the event’s target demographics, I’m glad we made the effort to attend what’s currently one of the best winter arts and music outings for parents and kids in the Twin Cities. After making Chewy Chocolate Chunk Cherry Cookies for Valentine’s day, it was time to put some thought into the Valentine card. There are some really appealing store-bought options out there that the kids would love, however, we opted to go the homemade card route. I might have been happy with a simple heart-shaped valentine and some variation of roses are red. Then I thought about wrapping treats in comic strips or stuffing the strips into the cellophane bag with treats just for laughs. It caused me to wonder about the modern-day comic. I have never been one to religiously follow any particular comic strip. I do remember reading Garfield a bit as well as some Peanuts. I started delving into the world of comics online. It’s alive and well let me tell you. Calvin and Hobbes on gocomics.com has forty comments on today’s comic strip about sledding. 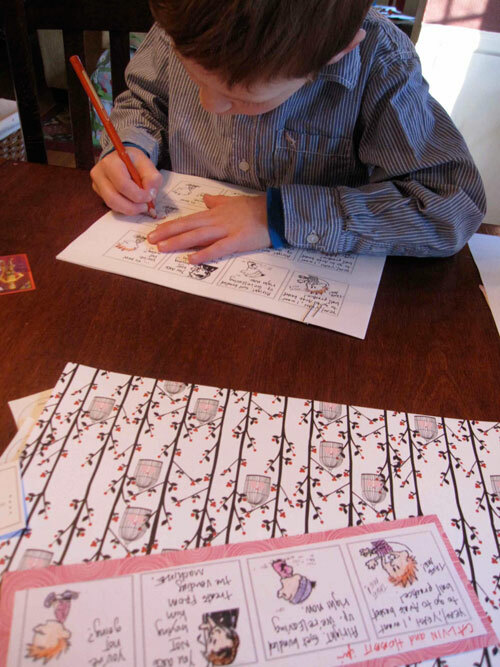 We wonder, if we made our own comic strip, what would it be like, what would we talk about? If there’s one re-occurring theme with my Calvin, it’s that he’s absolutely starving all of the time. And when he’s not starving, he’s dying of thirst. Obsessed with food. Ideally for him, he would live in Middle Earth and have ‘ses on every hour if he could…. nineses, ten’ses, elevenes…..
My Calvin gets a kick out of reading this continually. That really did happen, he says. We set up a mass production line for 19 cards for classmates and he colors them in, laughing and intense concentration alternating. Ava’s got hers going too – a spoof off of the comic Jane’s World, a strip for all of those girls out there just trying to figure life out. 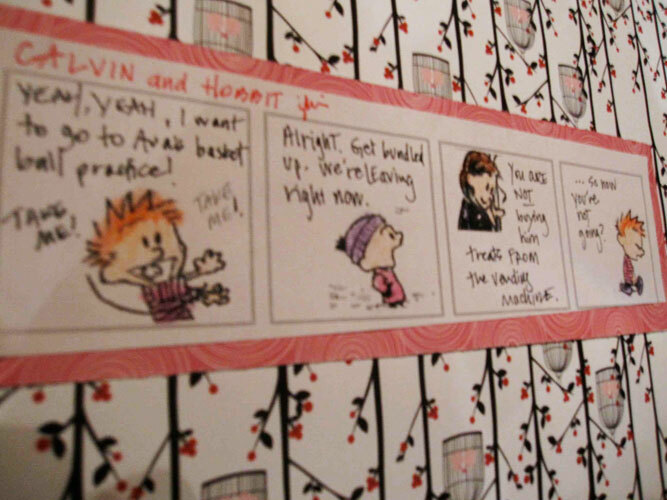 This strip would be recreated in our eyes as Jaine’s World (as in Ava Jaine). Ava Jaine is a kind soul. Born a gemini, she is a teacher and explorer by nature, patiently finding her way in the world. We started a strip about her hair, then it got WAY to sensitive to complete. For a later activity, perhaps. 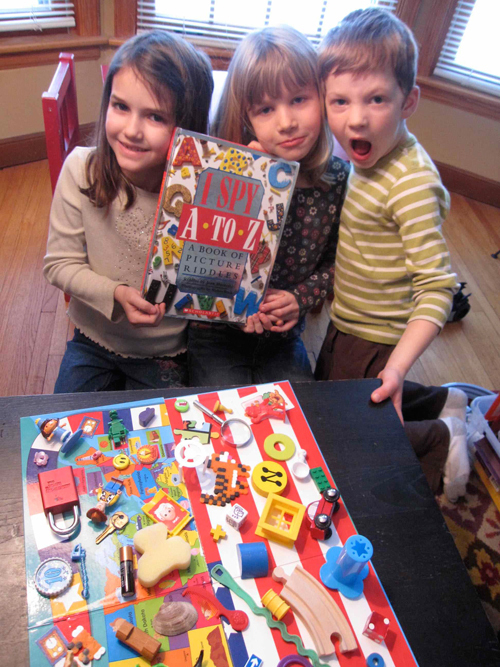 In addition to the strips, we found 39 fab ideas on familyfun.go.com including this rocket (5) and iPod (31). Those will go to the classmates along with the comic strips. I’m working on variations with less candy – the rocket with only Hersey kisses, no lifesavers and the iPod with only Reeses, not the sweathearts too. What fun am I? We will just have to see how things go over for the kids on February 14th. I was first introduced to cherry flavoring via Hubba Bubba Bubble Gum. You could say I had a cherry crush (not like Orange Crush the soda, just a love of cherry). I couldn’t make a 5-pack of Wild Cherry last more than a day. Then there was a long intermission. In my late twenties, out of boredom from other Ben & Jerry flavors and an attempt to make a healthier selection, I made my first pintly purchase of Cherry Garcia ice cream (bing cherries and dark chocolate). Years later Cherry Coke followed suit. 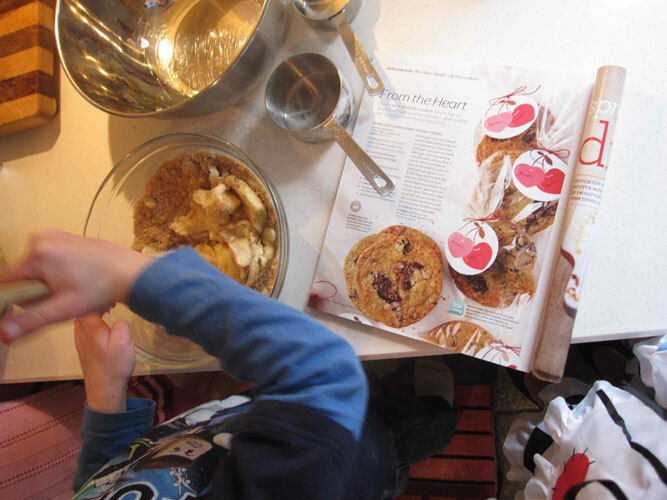 And now, in another winning cherry and chocolate combination, my kids and I uncovered Chewy Chocolate Chunk Cherry Cookies courtesy of Martha’s February issue, just in time for Valentine’s Day. It’s a really simple recipe really. The sweetness of the cherries balances out the chocolate and the cherries keep the cookies moist. 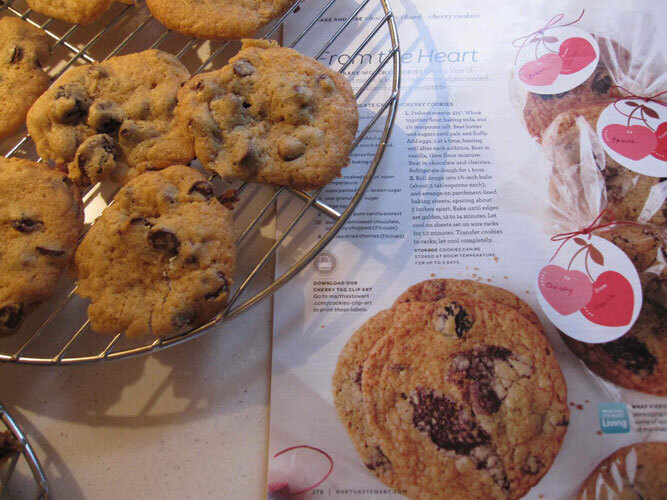 It’s a different twist on your traditional chocolate chip cookie to show those on your Valentine list you put a little thought and effort into the treat. I brought in my son to help measure and mix – including the fold-in technique (very important so as not to crush the cherries and chocolate) and my daughter to roll the dough and place on the baking sheet. 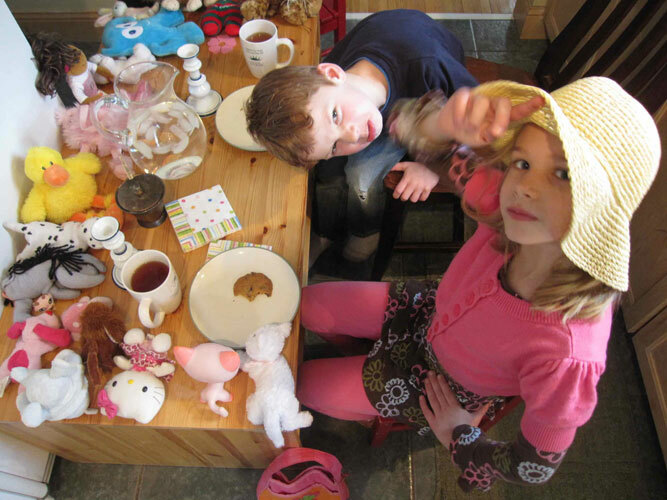 They both had the job of attentively watching them bake in real-time and tasting at our tea party. Present at the party was Ava in her sundress and wide-brimmed hat, Calvin with a smirk that said tea parties are not my thing and a t-shirt that would have read “I’m only here for the cookies,” and me in my Alice in Wonderland costume from three Halloweens ago. I mention this because I can’t say that I have ever worked in the kitchen in heels or a costume. It did get an eyebrow raise from my husband. 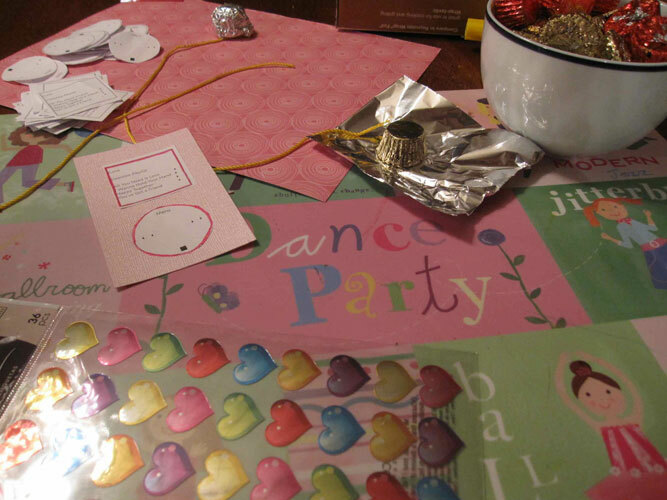 At half-past four, it was time to end the party and Part 1 of Valentine’s Day prep. We all agreed that the combo in the cookies was a good one and that cherry, indeed, is a flavor to savor. Now, would we want to share? Part 2 will include the valentine care and card packages we’re scheming up. Family and adults will get the full-on cookie package and kids, through their valentine exchanges at their schools, will give non or low-in-sweet-treats valentines (if I can at all have a say it in) with homemade cards (if I can hold over over the super convenient store bought options).